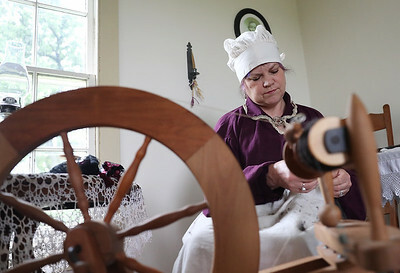 Helen Anderson of Harvard spins wool at the Powers-Walker House in Glacial Park Sunday, June 10, 2018 in Ringwood. 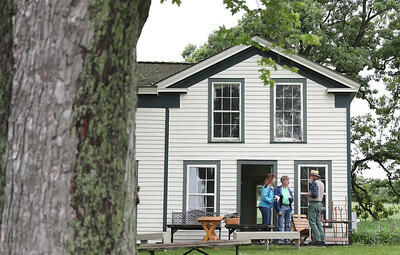 An ice cream social was hosted at the house and showed visitors a glimpse into life in the 1850s. 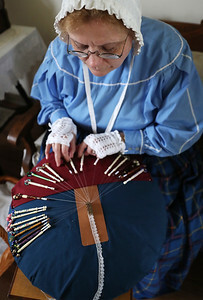 Carolyn Hill of Grayslake demonstrates the lengthy process of making handcrafted lace at the Powers-Walker House in Glacial Park Sunday, June 10, 2018 in Ringwood. 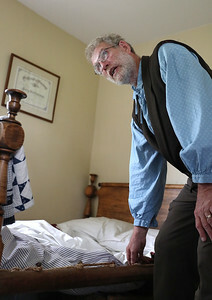 Fred Durrenberg of Johnsburg talks about life in the 1850s with Theresa and Tom Baughman of Algonquin at the Powers-Walker House in Glacial Park Sunday, June 10, 2018 in Ringwood. 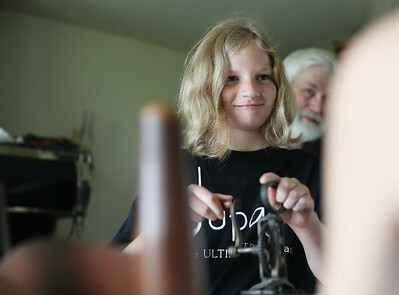 Addy Dominski, 10, of Huntersville, Minn., churns butter at the Powers-Walker House in Glacial Park Sunday, June 10, 2018 in Ringwood. 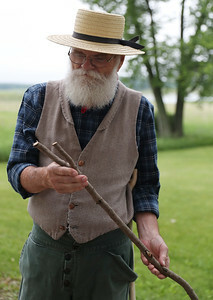 Fred Durrenberg of Johnsburg talks about handcrafting walking sticks in the 1800s at the Powers-Walker House in Glacial Park Sunday, June 10, 2018 in Ringwood. Gus Weinreis shows the workings of an 1850s cast iron stove and oven at the Powers-Walker House in Glacial Park Sunday, June 10, 2018 in Ringwood. Weinreis has been a volunteer with McHenry County Conservation District for more than 25 years. 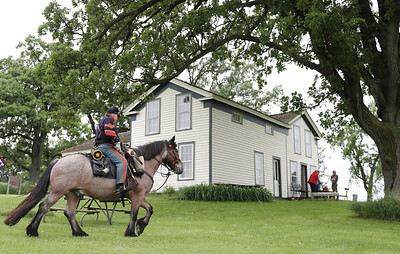 Ward Brown of Richmond, dressed as a cavalryman, rides Buddy at the Powers-Walker House in Glacial Park Sunday, June 10, 2018 in Ringwood. Buddy is a Belgian/Quarter horse cross with Bay Roan coloring. 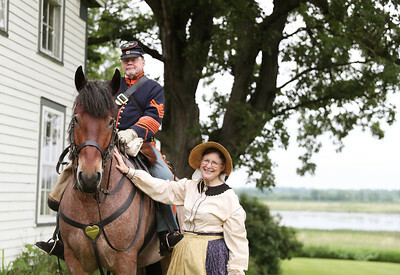 Ward Brown of Richmond, dressed as a cavalryman, poses with horse Buddy and wife Gail Brown at the Powers-Walker House in Glacial Park Sunday, June 10, 2018 in Ringwood. Buddy is a Belgian/Quarter horse cross with Bay Roan coloring and accompanies Brown to historic war reenactments. 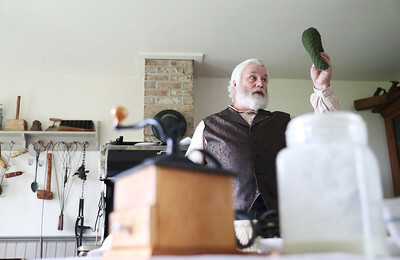 Buck Wallace, a volunteer with McHenry County Conservation District, talks about the type of materials used for bedding in the 1800s at the Powers-Walker House in Glacial Park Sunday, June 10, 2018 in Ringwood.